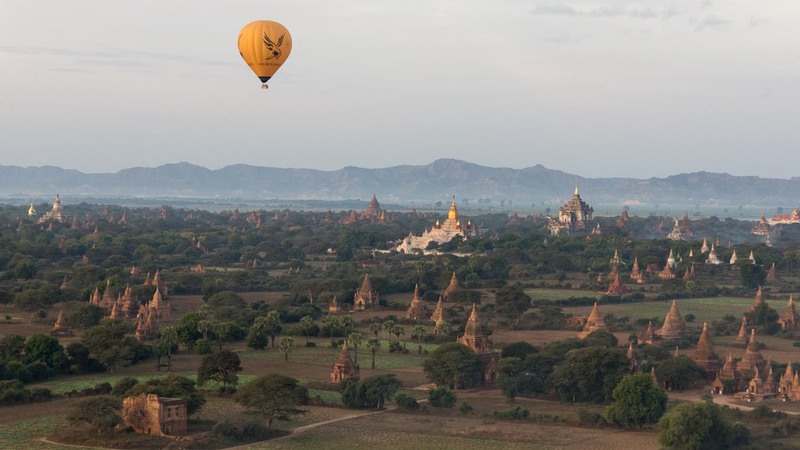 ← “Mingalaba” From Myanmar, Land of The Golden Pagodas! Previous Post: “Mingalaba” From Myanmar, Land of The Golden Pagodas! 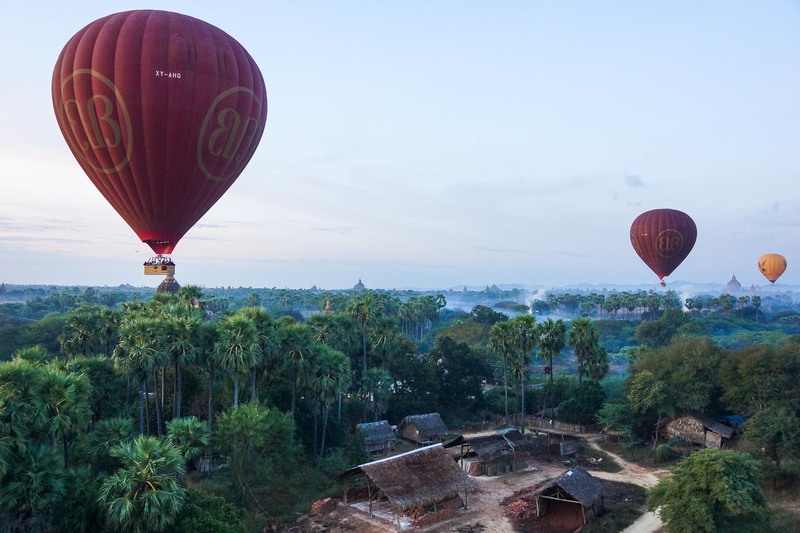 As far as the eye can see brick and stucco structures – stupas, temples, shrines, monasteries – bear witness to a remarkable moment in history on the east banks of Myanmar’s Ayeyarwady River. Time has not been kind to many of these buildings; nor have the relic hunters over the ensuing centuries who smashed their way into hundreds of stupas and seated Buddha figures looking for relic boxes. 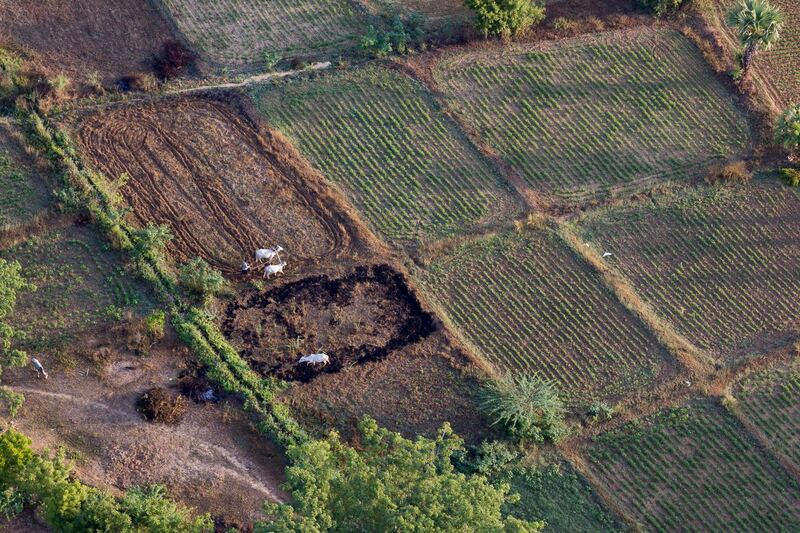 In 1975 a major 6.6 earthquake hit the Bagan area – one of an estimated 400 since 1900 – and did significant damage to many of the structures. 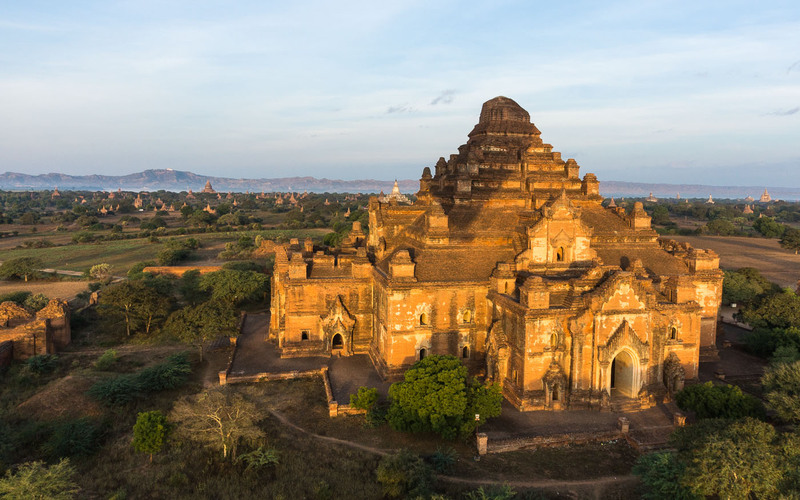 In spite of all this , and in spite of the clumsy and the often just-plain-wrong attempts of recent renovators of the Bagan Archaeological Zone to spiff up the structures, what one sees is still magical. 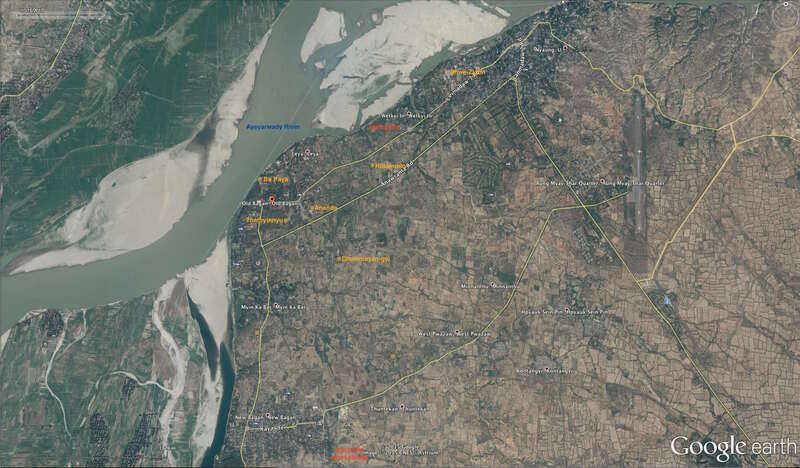 Turn back the clock 750 years and we would be in the capital city of a thriving kingdom which controlled the agricultural wealth of the Ayeyarwady River basin. 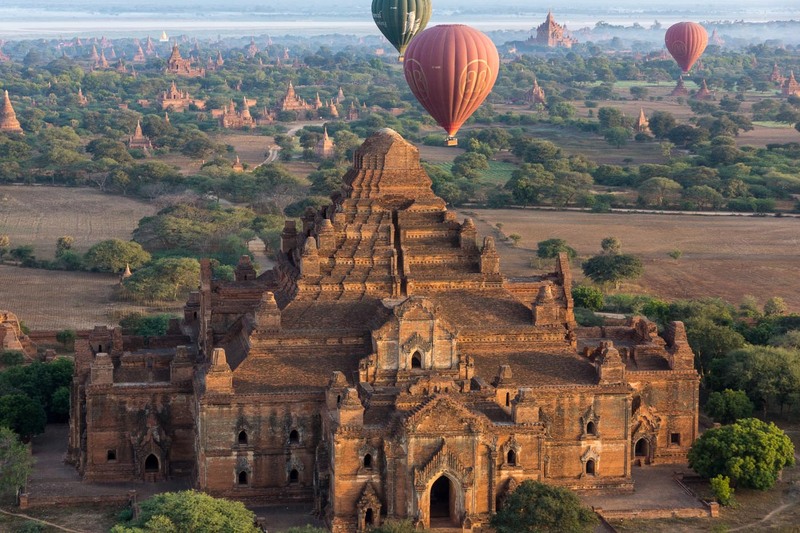 The city – Bagan (referred to in older books as Pagan). And the people? 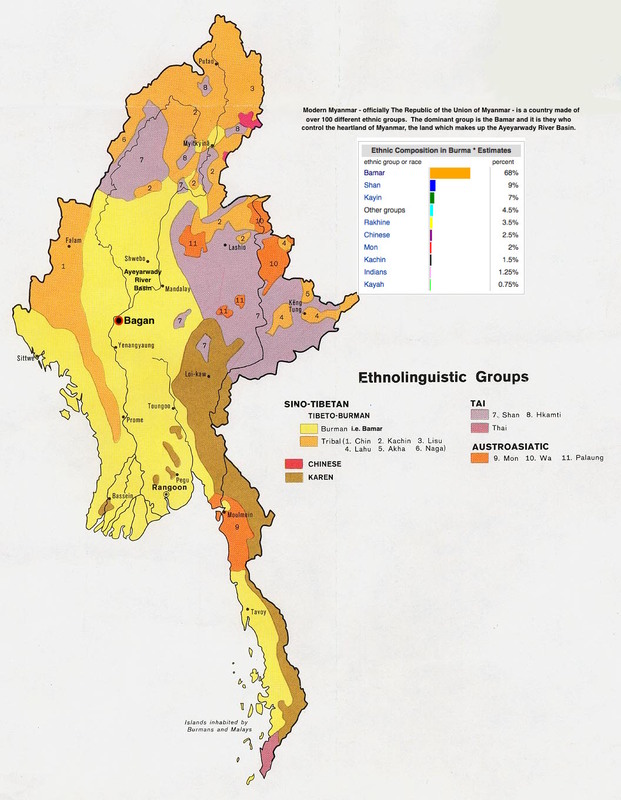 They are the Bamars – again, formerly referred to as Burmans or Burmese. They speak a Sino-Tibetan language and had migrated into the Ayeyarwady River basin from the Himalayas to the north about 1500 years ago. Over the next five hundred years as they grew in power, they conquered and absorbed the Pyu and Mon societies they found and incorporated elements of those cultures into theirs. One of those things was Theravada Buddhism, which was merged with the pre-Buddhist animism that they practised. 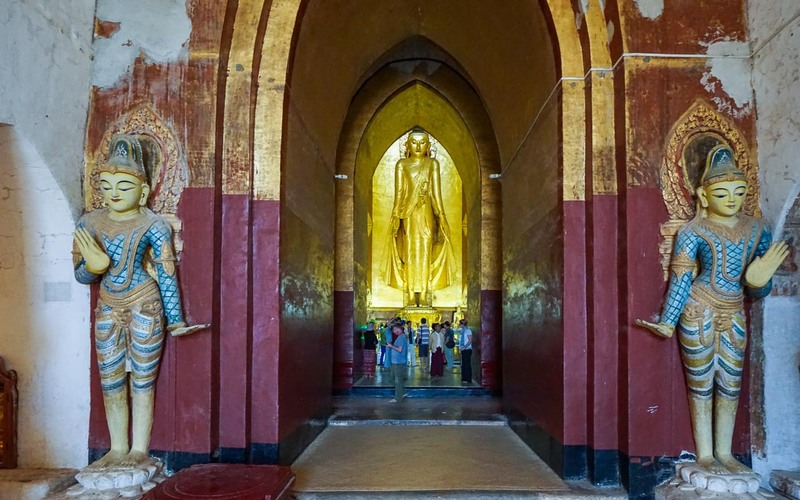 It involved the worship of many spirits or nats and to this day there is a major centre of nat worship nearby at Mount Popa, a very common day trip for visitors staying in Bagan. 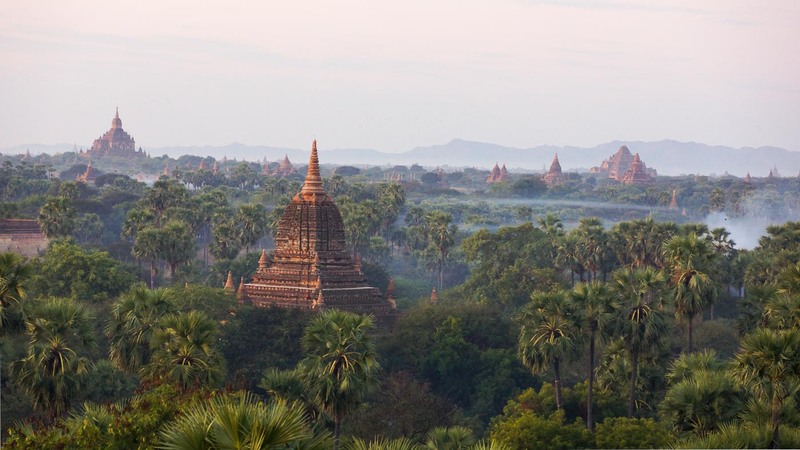 Bagan thrived from about 1000 C.E. to 1300 C.E. and a succession of Bamar rulers commissioned an astonishing number of religious structures. 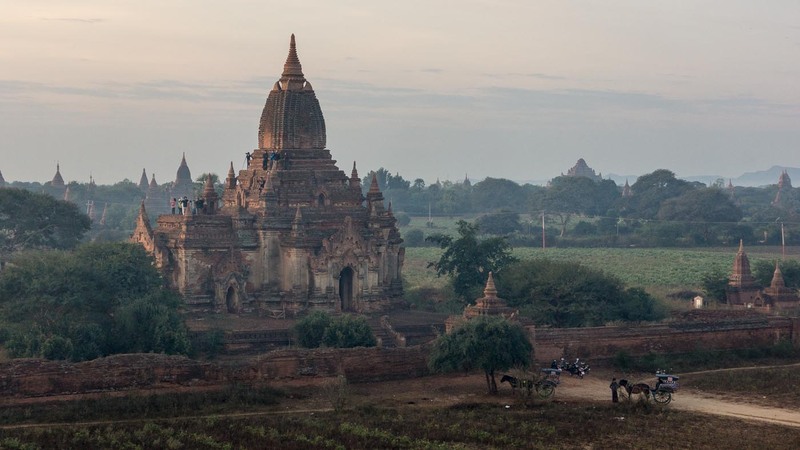 These buildings celebrated the Buddhism they had embraced after their entry into Myanmar. Not only were the buildings seen as evidence of the power of these rulers in this world, but it was also believed to earn its royal builders merit (or karma) for the next life. To make their positions irreproachable, kings would sometimes reveal genealogies which showed that they ultimately were of divine origin. 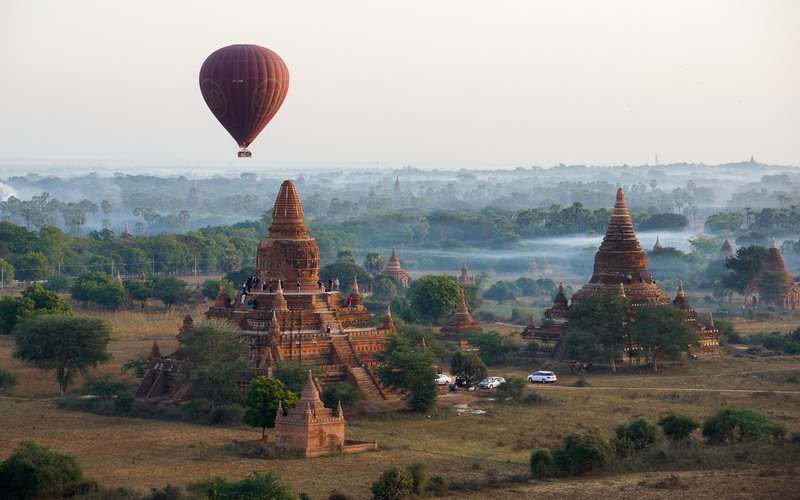 It is this world that a modern visitor to Bagan tries to get a handle of. Overwhelmed by the sheer number of potential stupas and temples to visit – and by the unfamiliar history and names which were never a part of any western history class! 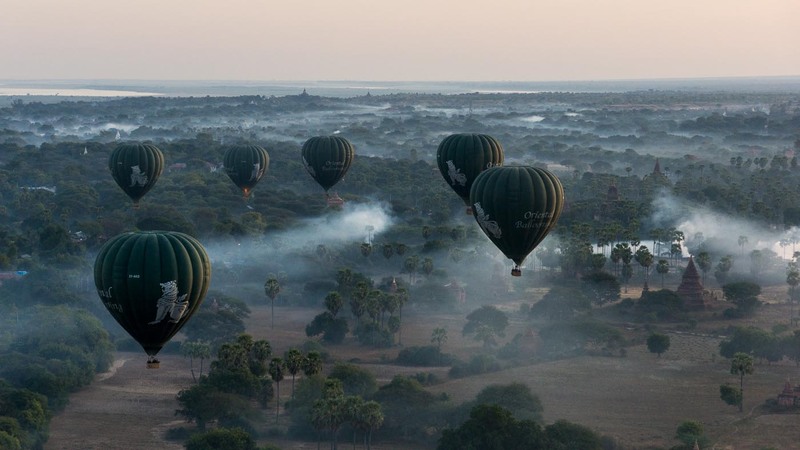 – a highly recommended thing to do is the forty-five minute to one hour balloon ride over the 65 square kilometers (25 square miles) of the Archaeological Zone. It certainly does not come cheap – it is currently $320. U.S. – but those who are able to rationalize getting a ticket are almost 100% agreed that it was one of the highlights of their trip to Myanmar. I know – I overcame my reluctance and am really glad I did! Here are some pix of a very memorable hour that I spent early one February morning floating over the ruins of the once-capital of the Bamars. 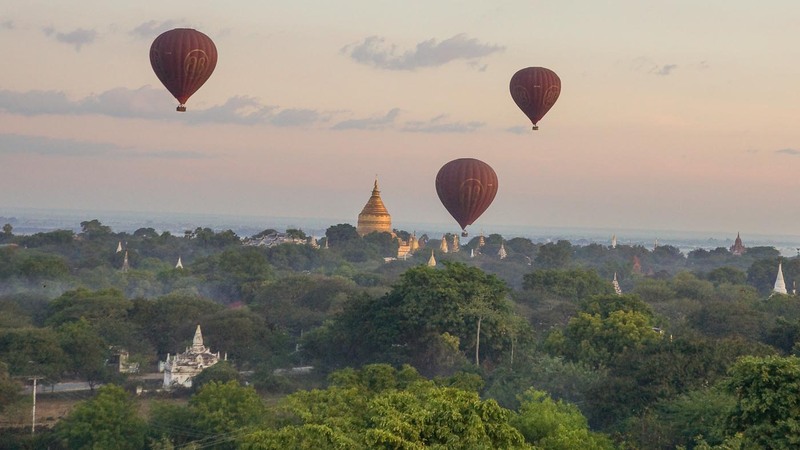 There are three companies offering a balloon ride over Bagan’s Archaeological Zone: Golden Eagle Ballooning, the newest of the three, having started in late 2014; Oriental Ballooning, a 2013 start-up; and Balloons Over Bagan, the pioneers of hot air balloon operations, not only in Bagan but in all of Southeast Asia. It started in 2001 and currently has 10 balloons. While I am sure all three outfits do a fine job, I went with the originals. 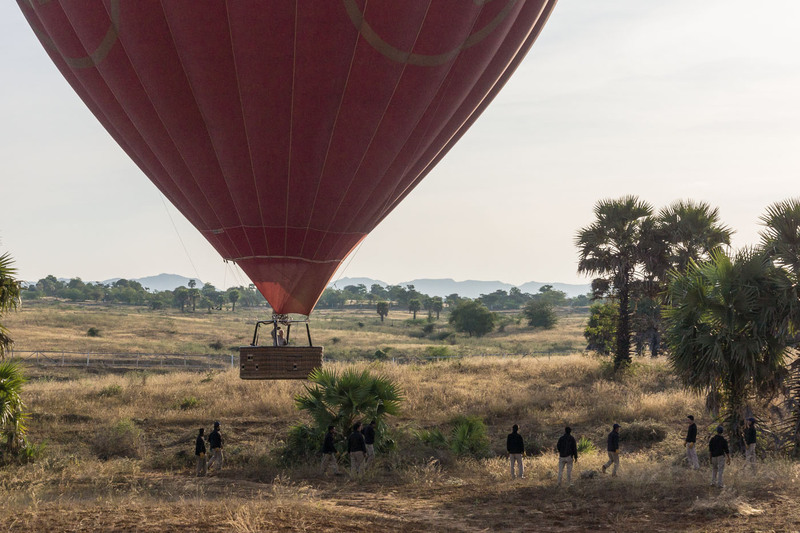 After a 5:45 a.m. hotel pick-up we were driven to a field on the southwest end of Nyaung-U where the balloons were being readied by some of the 100 local staff in their employ. The baskets of our balloons had room for sixteen guests as well as the pilot. In our case it was a very personable English guy by the name of Mike who had everyone laughing – and then seriously listening to his safety instructions – in short order. 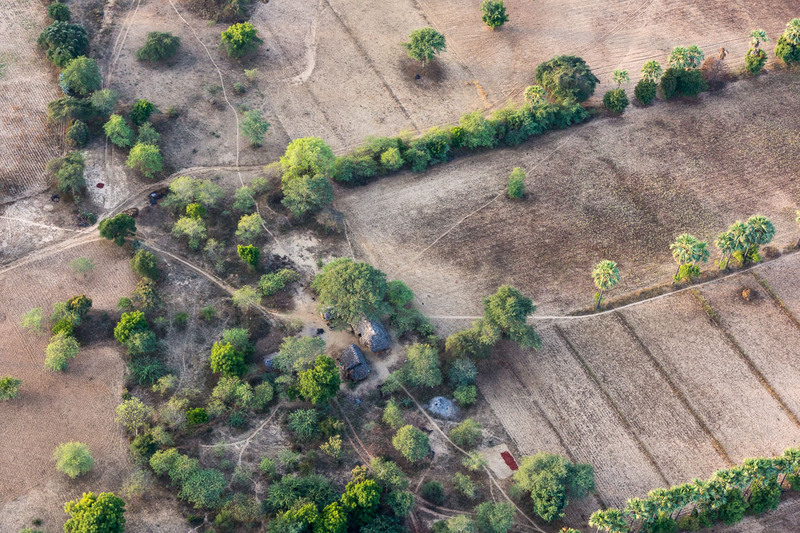 Over the next hour we would float our way south and east until we landed in a field near New Bagan. Mornings are the preferred – and often only – time that the balloons go up. The heat of the afternoon and its impact on wind currents makes it much more difficult to pilot. The balloon season coincides with winter – November to March – and tickets can be scarce. Many have booked the ride long before they arrive in Myanmar; I requested a ticket two days before and luckily scored a last-minute spot. The ride was remarkably smooth and the pilot provided a concise commentary as we flew over various landmarks. 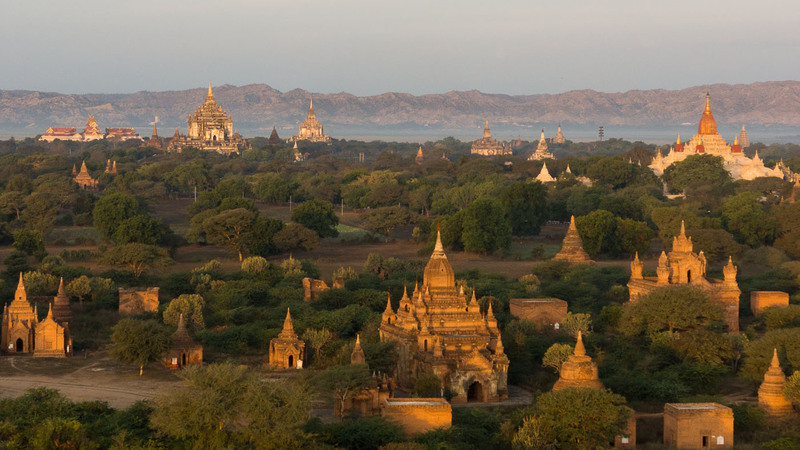 In the image below, I am looking back at Shwe-Zigon, perhaps the single most impressive stupa (the Bamar term is paya) on the fields of Bagan. Later that day as the sun set we would pay it a up-close visit. 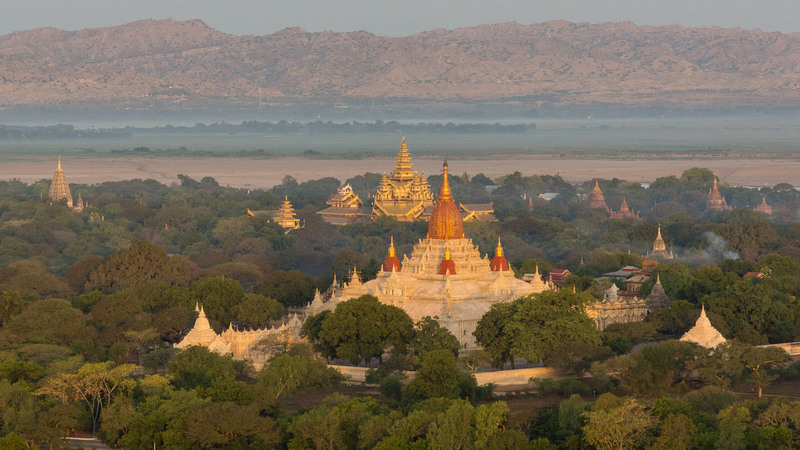 early morning mist and smoke rise over Bagan fields – Htilominlo and Dhammanyan-gyi in the distance and a stupa I can;’t identify in the foreground! 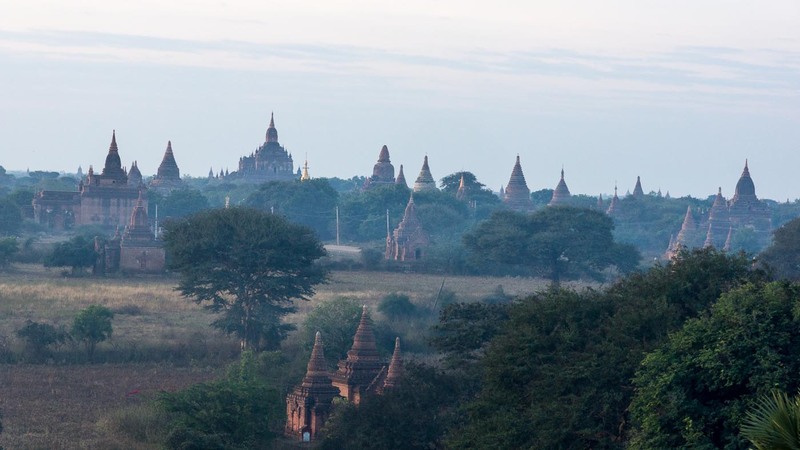 a few of the countless spires of Bagan! 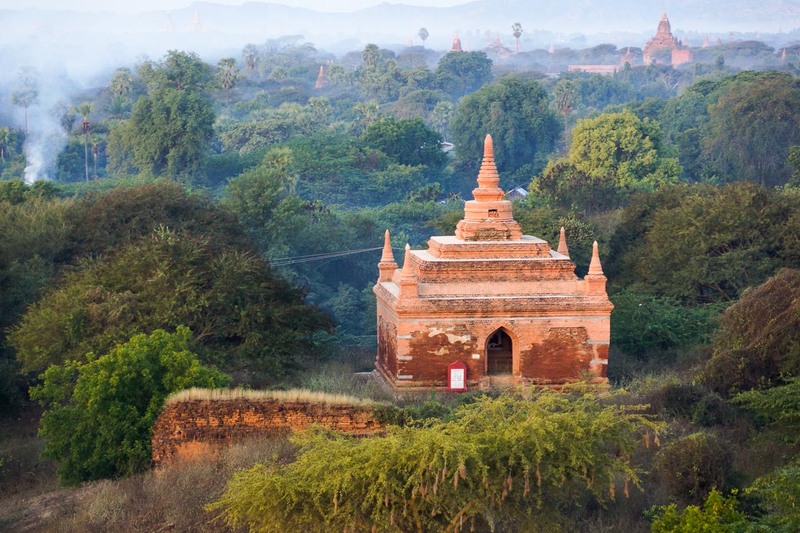 The distinction between a stupa (paya) or temple (pahto) is that the former is essentially a solid relic mound placed over some object considered sacred (strands of the Buddha’s hair is a common one in Myanmar) while the pahto can be entered. 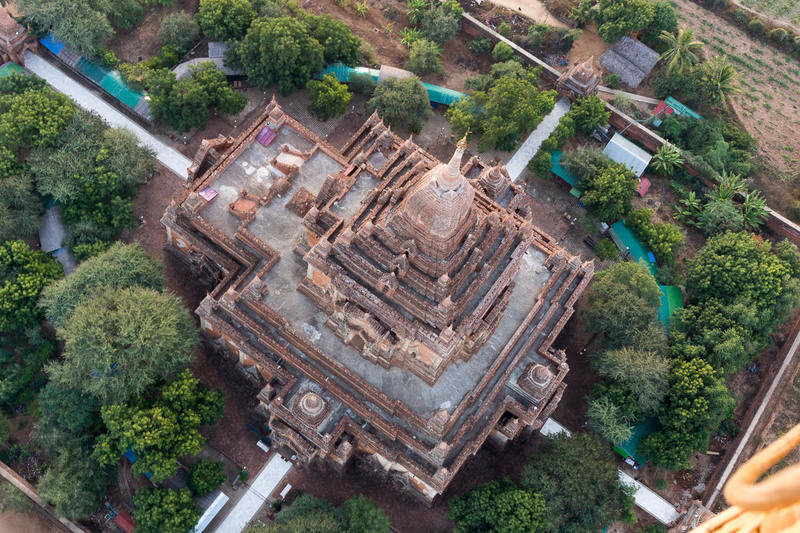 While the Shwe-zigon is a stupa, the structure below is a temple. Later that day we would visit a number of temples and stupas and see the paintings and statues contained within some of them. I read somewhere that an estimated six million bricks with an average size of 36x18x6 cm. 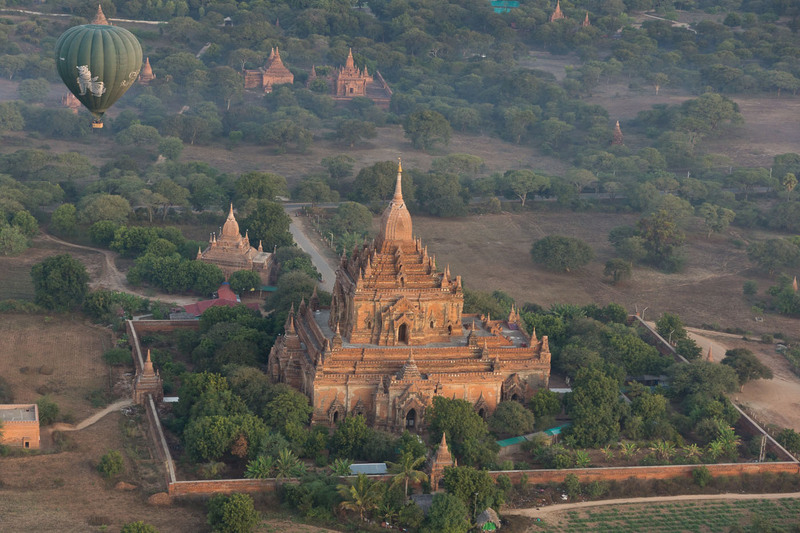 were used in the construction of the Dhammayan-gyi, one of Bagan’s larger temples. Multiply this by a thousand and you have some idea of the impact of dedicating the economy’s resources to this massive building campaign for almost three centuries. It brings to mind the similar focus in ancient Egypt on the construction of increasingly ambitious funeral mounds for their god-kings. 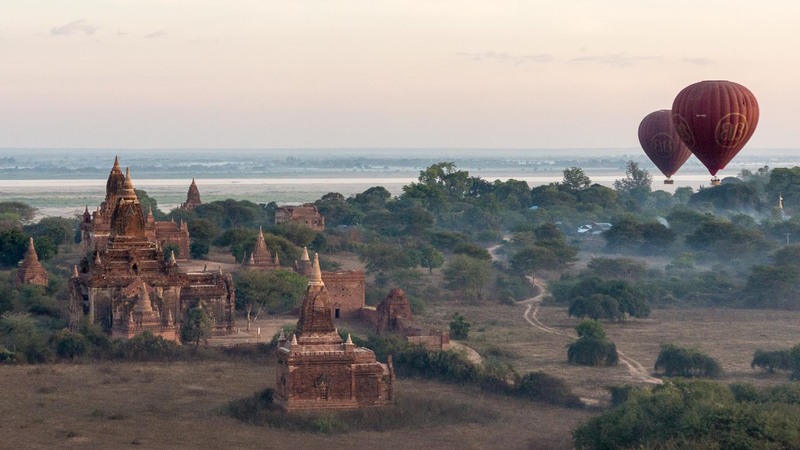 Whether for Bagan itself, or from Bamar villages up or down river, fired bricks arrived to create on the fields of Bagan a very visible attempt at gaining spiritual merit for the next life by contributing to the construction of edifices honouring the Buddha in this life. Even villagers could contribute with their humble donation of fired bricks. And as in ancient Egypt, a closer look at the architecture reveals a increasing complexity and sophistication of buildings over the 300 year time span. 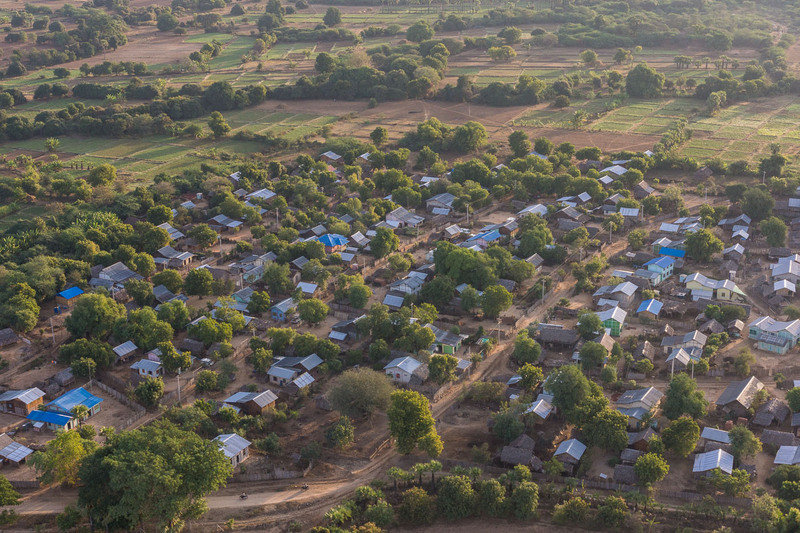 In 1990 villagers living in the archaeological zone – and particularly in Old Bagan – were forcibly moved a few kilometers to the south to what has become New Bagan (Myothit to the locals). The stated intent was to protect the monuments from potential looters and treasure seekers, who were selling bits and pieces of the temples and their art work to tourists. Admittedly, it did also clear the area for the development of international tourism. 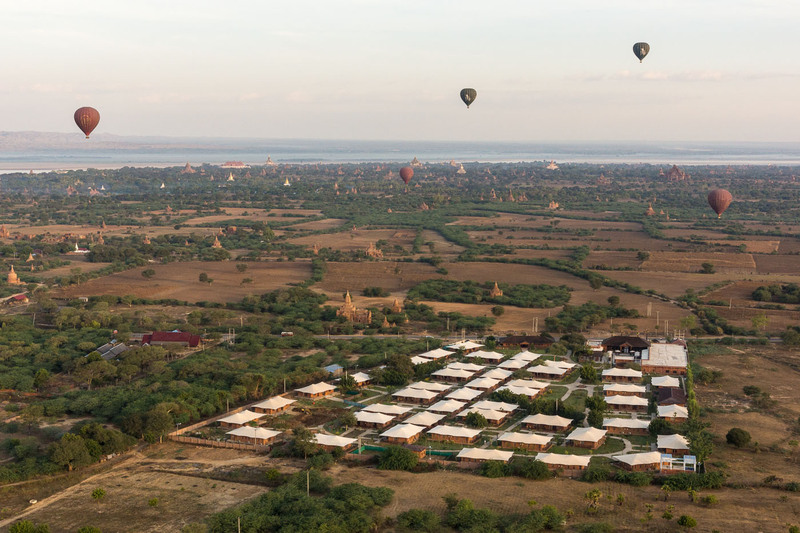 You will find in Old Bagan these days some upscale hotels; the budget and mid-range ones will be found in New Bagan and in Nyaung-U. Are you nuts! $320.U.S. for a balloon ride? How can you justify this while all around you there are people who don’t even earn that in a month? 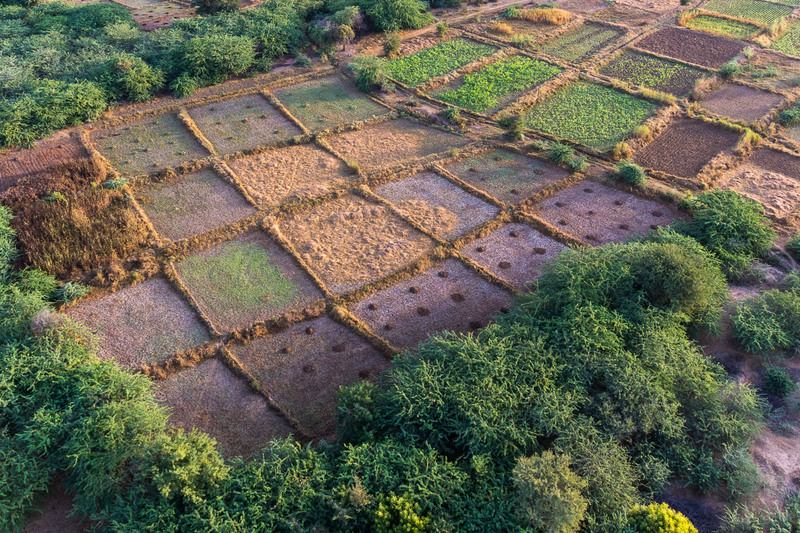 We floated down onto a field in which local farmers were working the soil of Bagan as they have been for the past thousand years. What could they have thought as we settled down? Perhaps they do not even react anymore since it has become an everyday occurrence in their world over the past decade. 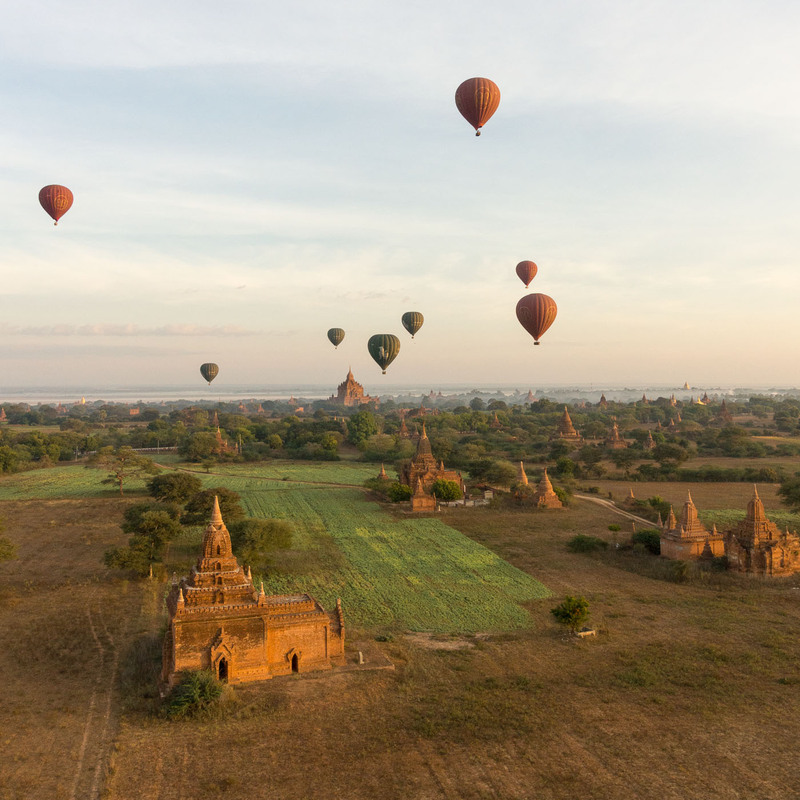 Near them were other locals, young men working for Balloons Over Bagan whose job was to anchor the balloon on landing and then packing it all up carefully for the return to base camp, where they would get things ready for the next flight. The image below has a dozen of them, all in uniform and a part of a team just like the farmers. The company employs about one hundred locals to make the business work. The few non-locals would seem to be the pilots and mechanics, although I was told that some locals are receiving the necessary training so that they can work their way up in these areas too. 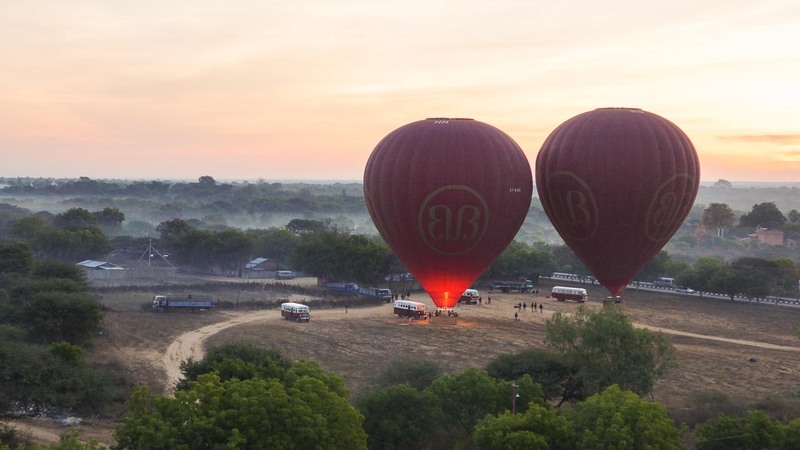 Clearly the balloon business is opening up opportunities for Bagan’s next generation. Back to the $320. Subtract the unavoidable government tax of at least 10%, the cost of the pretty pricy balloon and its upkeep, the salary of the skilled and probably difficult to find pilot, the well-trained mechanics, the ground crew, the insurance, the semi-annual safely checks and certificates necessary to stay in the air…well, you get the picture. 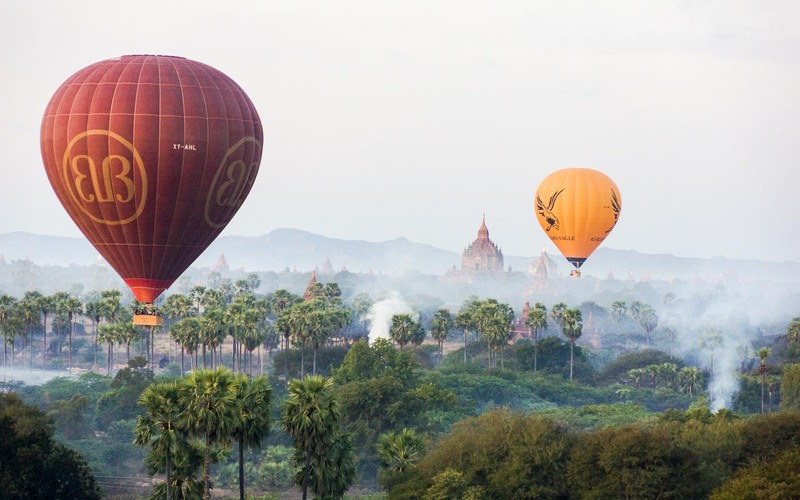 In the end, while the company founders are undoubtedly being rewarded for their initiative and business skills, your money is going to all sorts of people who live in Bagan and are better off thanks to the opportunity that Balloons Over Bagan has provided them. And what do we get? An incredible view of one of Asia’s cultural wonders. It’s right up there with Angkor Wat and Anuradhapura and Xian. 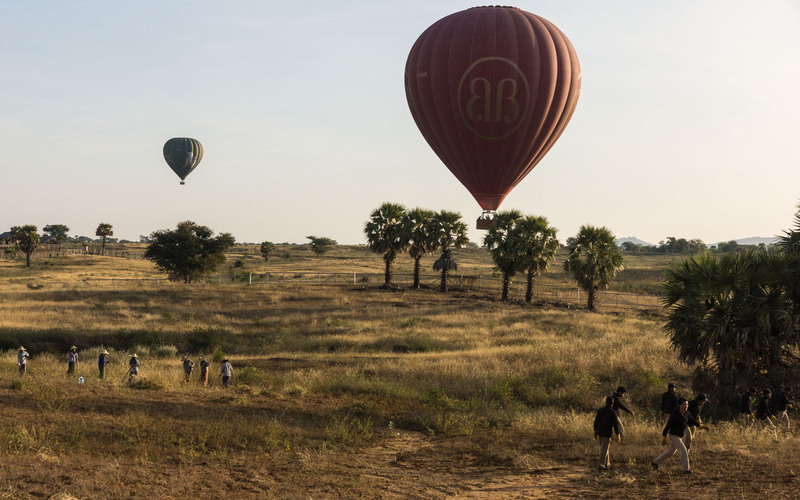 Our memorable flight over the plains of Bagan over, we stood in the field and watched as the crew rolled up the balloon and got everything back in the support vehicle. There was enough time to chat with our basket mates while we sipped on a glass or two of champagne and sampled the croissants. By 8:30 we were back at the hotel and telling those who had chosen not to go about our “wow’ experience. 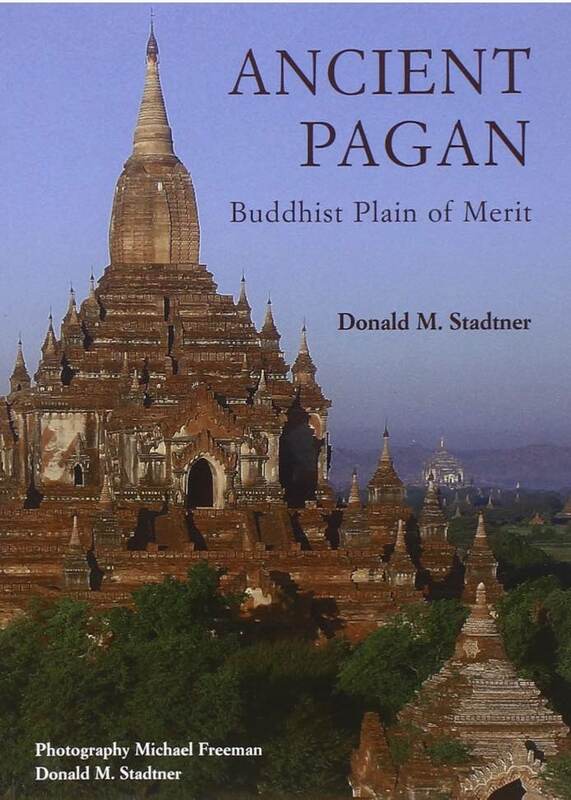 The ultimate guide to the Bagan Archaeological Zone is Ancient Pagan: Buddhist Plain of Merit by Donald M. Stadtner with photography by Michael Freeman. It is solidly researched and very readable, as well as liberally illustrated with high quality colour images. I read it before I left for Myanmar but it was one of the last things I took out of my duffel before I left. Why? It weighs 1.5 lbs! An ebook version would have been great to take along. 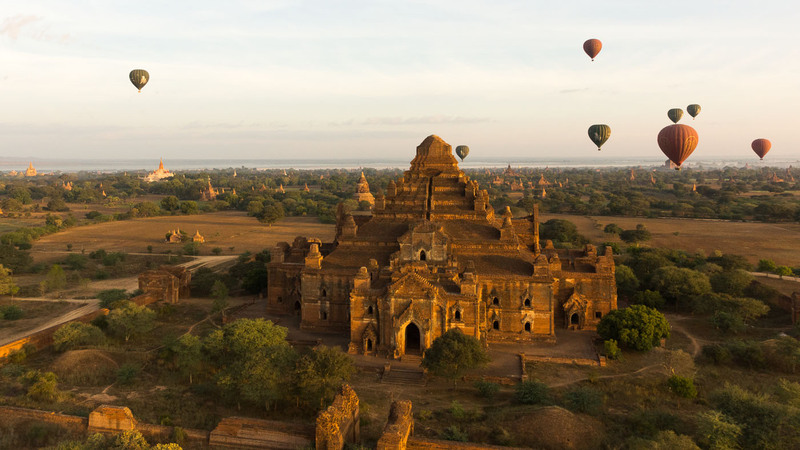 The website Asian Historical Architecture does a well-researched examination of the most significant of Bagan’s stupas and temples. 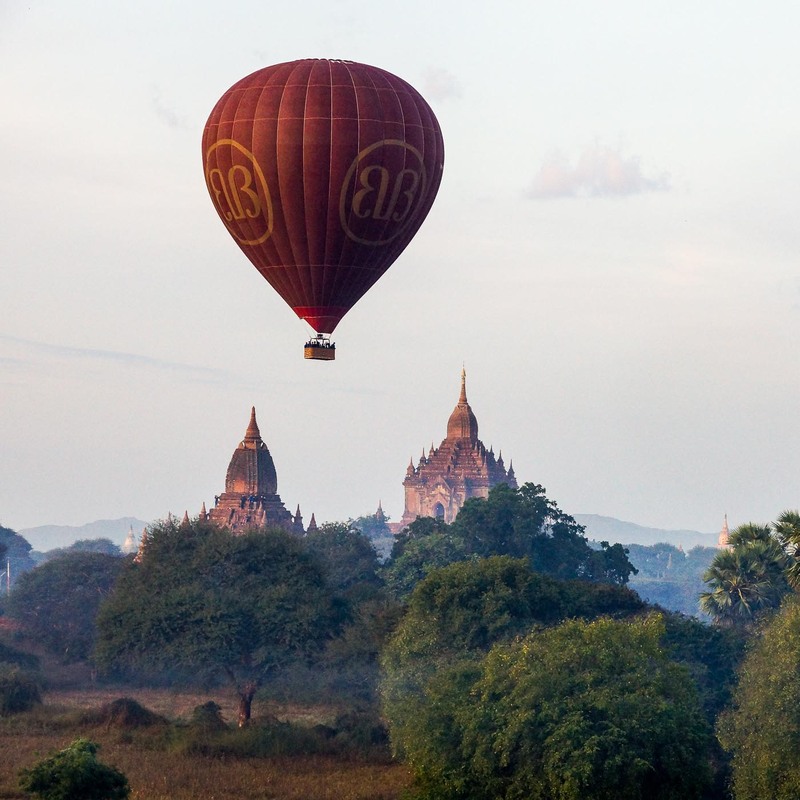 Google Balloons over Bagan and you will find lots of info on the company and on the experience in general. Check out this tripadivisor link – over 140 reviews with an average of 5 on 5. That says it all! 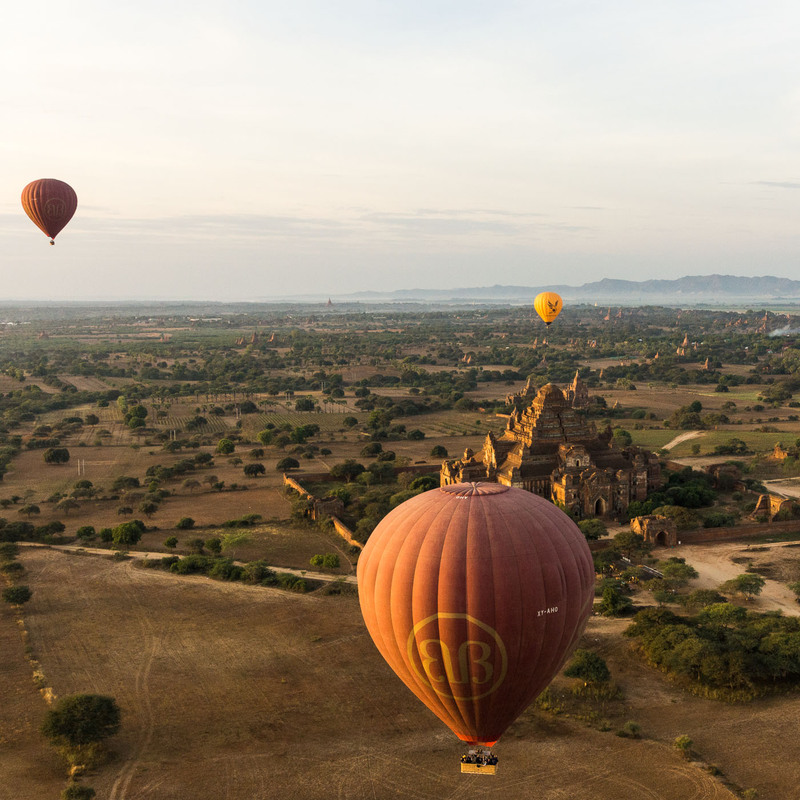 This entry was posted in Myanmar and tagged Bagan archaeological zone, bagan ballooning, Bagan ballooning cost, bagan earthquate 1975, Bagan satellite map, Bagan village relocation, ballon with Shwe-Zigon, ballooning over Bagan, Dhammayan-gyi aerial view, payas and pahtos of Bagan, plains of Bagan, Sulamani Temple aerial view. Bookmark the permalink.